Bear is a portable tool which displays the system resource use (in terms of GDI and User Objects) of all your running processes. You could do something similar by using Process Explorer, of course, which is a far more sophisticated utility. Even Task Manager will give you a summary of the same information. But Bear may still be useful for in-depth monitoring as it provides many more details on your process resource use. Examine a process like Explorer.exe, say, and you won't just see a figure for the number of GDI or User objects it owns. 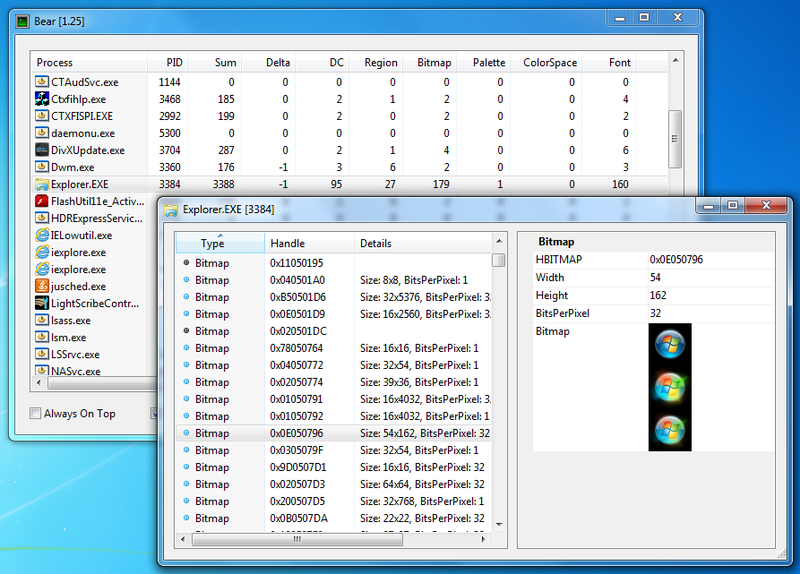 Bear actually displays a full breakdown, detailing its bitmaps, fonts, palettes, regions, brushes, and much more. And that's not all. Double-click a particular process and you're able to review all of its resources, so for instance you can check the colour of a brush, or look at a particular bitmap. Bear is plainly targeted at developers. Any knowledgeable Windows user could also benefit from the program, though, as it makes it easier to track down and understand resource leaks and similar problems. Grab a copy for your portable troubleshooting toolkit. Bear is one of the more technical system monitoring tools around, but you don't need to understand everything it's doing to find the program useful, and it remains an interesting way to keep an eye on your resource use.